Sunrise gave what appeared to be a sneak preview of the day to come at SeaLink Magnetic Island Race Week – hot, sticky and a little airless, Denis Thompson and his team new they were in for another morning of hard decisions after yesterday’s testing conditions where light wind changed direction at whim. 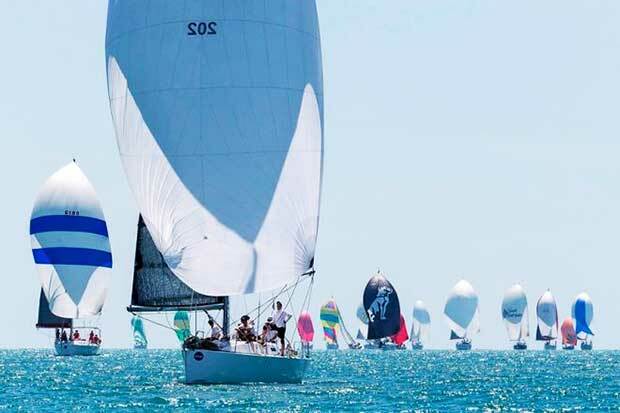 A postponement ashore for the Townsville Yacht Club’s (TYC) 11th Race Week and finally the fleet was on the water and PHS Division 1 kicked off racing at 12.25pm, with PHS 2, 3, Non-Spinnaker Division and Multihulls starting at five minute intervals after. Each division piled up at the boat end of the line, with a few loud voices heard when the going became too close. Tony Muller, owner of Brava, humorously relates: “Big Vanilla (at 17.5 metres) nearly killed everyone on the start line, stuffing up little Vanilla (16.2m) and us. Little Vanilla only just managed to avoid t-boning them, and little Brava (12.3m) had to avoid t-boning both. “It was a great day otherwise. We had a lovely shy kite run home, the breeze topped out at 18 knots,” PHS Division 2 competitor, Muller, said. The two Farr 40s Ponyo (David Currie, Vic) and Guilty Pleasures VI (Hughie Lewis/Gary Cripps, Tas) were on for another match race and both crossed the start line early, but both recuperated quickly in a pleasant light 5-7 knot breeze. 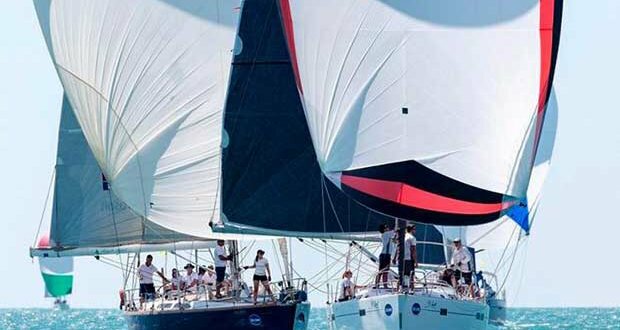 It didn’t affect Ponyo, which finished second to Tony Ritter’s Thompson 7 sports boat, Spank, with Mach 1, owned by Townsville Yacht Club Commodore, John Stokes, third. Just when all looked to be a light race, the wind kicked in as the Division 1 yachts came to a mark, kites set and bearing away. As the breeze increased, Therapy’s (Thomas Hoogenbosch, Vic) kite shred, her crew having to get quickly into gear to pull it down. Ashore, everyone seemed happy enough. Doug Shields skippered Vanilla 2 today and said he and the crew had thoroughly enjoyed the kite run home. “That is our best point of sail and on the long leg we made good speed,” Shields said after picking up substantial boat speed on the shy run home. “It certainly made up for our digression earlier on in the race,” he said in reference to the light 6-8 knots at the start of the race and the fading breeze coming to the second mark, which does not suit the Dufour 560 Gl. “The breeze shifted there and we got hammered by Vanilla 1 and others, but being wide, we picked up on the reaching legs and the leg home the breeze picked up to 10 knots plus. Nice,” ended Shields of their day in which they finished seventh and continue to lead Division 2 overall. On board too is John Middleton, a long time sailing instructor/race official from Melbourne. “This is my first time at Maggie – another one ticked off the bucket list,” he said referring to a nasty bout with prostate cancer. “This is a pretty good place to be – meeting up with a lot of old friends from years gone by. “It was a bit light for us today. Hopefully we can hold our position, have a good race tomorrow and finish on the podium.” Vanilla 1 finished fifth today to maintain second place overall – on equal points with her main rival at this regatta. On today’s Division 2 winner, ‘Little Miss Sunshine’, the Beneteau Sense 50’s owner, Sam Pavic, was explaining the name. “It’s for my wife Denise (she’s also racing here). The tender is called ‘Mr Grumpy’ and that’s for me,” he said, before anyone else got the chance. The win today has lifted the beautifully appointed boat up to 10th place overall and the nine crew aboard had a good day out, including Kevin Wilson, who normally does duty as a race offer, having a rare few days off. 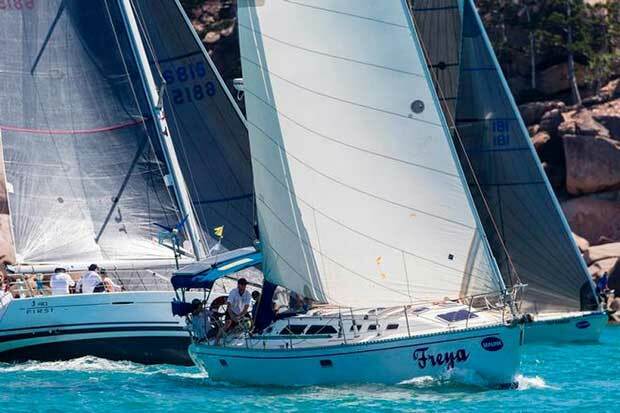 SeaLink Magnetic Island Race Week finishes tomorrow with one final race planned.